How do you determine which solar power system will work for your business? It’s a big investment requiring an in-depth study to ensure you make the best decision. Capital, tax credit, and other concerns can come up during the preliminary process. West Coast Solar wants to help you get the best commercial solar power system for your business. 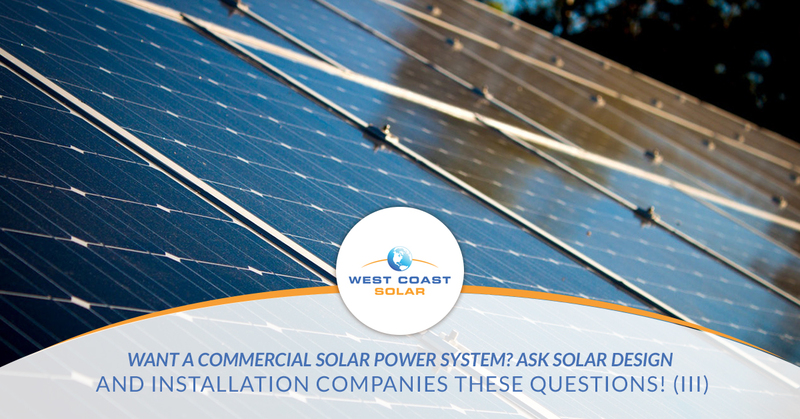 Want to learn some more top questions you should ask your commercial solar companies? Read part three of this blog series below to find out! Who’s responsible for system maintenance and ongoing upgrades (if applicable)? This is an important question quite a few solar power system purchasers forget to or neglect to ask prior to buying their system. Why is it important? Do you see yourself inspecting the panels, cleaning the panels, or fixing one if it encounters damage? Most commercial solar power systems should include regular maintenance and inspection, especially if you’re going to invest a significant amount of money to go green. Are there any incentives or tax breaks for going solar? Yes, there is major tax credit called: solar investment tax credit. It’s a federal incentive offered to those who go use solar to go green with energy consumption. As long as your system is finished and in operation prior to 31 December 2023, you could benefit from the tax credit. Make sure and check in with your tax professional to see if your business and potential solar power system qualifies. Alongside the federal tax credit, you may be able to acquire other benefits at the state and local level. It’s always worth discussing your project with a company that has served your area for a number of years. They should know what kind benefits you can leverage for going green with solar power. Which panels did you use for your own home or business? Sometimes it’s beneficial to ask the solar power specialist about their own purchase. It can reveal quite a bit about how much they know, invest, and believe in the technology. Granted, not everyone has gone solar, but if you get a salesperson who’s willing to be straightforward with you, they will be worth their weight in gold when helping you make the best solar power system decision for your business. At the end of the day, you have to make the decision. The most common commercial solar power system questions shared above should get you started on your path to invest in green energy. If you’re still not sure which solar power system is right for you, and you still have more questions, give West Coast Solar a call. You can speak with one of their solar power specialists and ensure your investment is going to get you the best green energy solution for you company. Learn more online or call today!